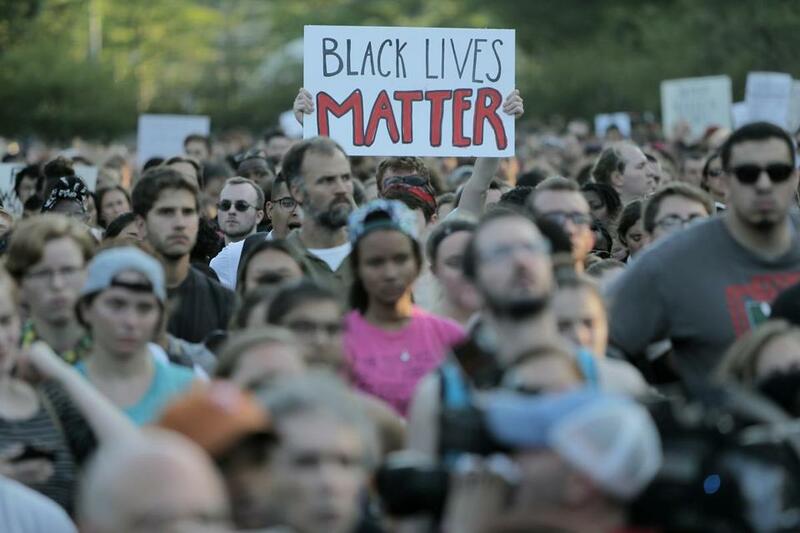 Protesters rallied outside the Boston Police Department on Wednesday. While a majority of Bostonians have a positive view of the police, one in three African-American residents does not believe that officers treat minorities fairly, according to a new poll. The poll suggested Boston, despite its commitment to community policing, faces many of the same tensions and feelings of distrust between police and minorities that have been laid bare in other parts of the country, following the recent fatal police shootings of black men in Louisiana and Minnesota and the killing of five officers by a sniper in Dallas. Indeed, the poll found nearly half of Boston residents believe the city faces the same problems as other cities when it comes to relations between police and minority residents. The live landline and cellphone survey of 301 Boston residents was taken Tuesday and Wednesday by the MassINC Polling Group and was commissioned by The Boston Foundation, as part of a town hall forum on policing that was aired on WCVB-TV Thursday night. The legacy of Boston’s troubled racial past was front and center Thursday night in a televised town hall forum. The results, which had a margin of error of plus or minus 5.7 percentage points, pointed to noticeable racial gaps in residents’ views of the police, as well as broad concerns about the economic and educational opportunities available to residents of different races. The poll found 73 percent of residents view Boston police favorably, giving the department even higher marks than Mayor Martin J. Walsh, who was viewed favorably by 56 percent of residents. About 82 percent of white residents had a positive view of the police, compared to 65 percent of black residents. Despite that upbeat assessment, 32 percent of African-Americans and 24 percent of other minorities said they do not believe that Boston police treat minorities fairly, compared to just 15 percent of white residents who shared that view. During Thursday’s televised forum, Rahsaan D. Hall, the Massachusetts ACLU’s Racial Justice Program director, said an ACLU study showed Boston police racially profile black residents. “Even when you control for crime [rates in black neighborhoods], black people are still stopped at a higher rate,” Hall said. Concerns about fairness expressed in the poll were by no means limited to the actions of the police. Less than half of those surveyed said they believe that residents of all races and ethnicities have equal access to quality schools and good housing choices. And just over a third said they believe that residents of all backgrounds have equal access to good-paying jobs. And while 42 percent said race relations in Boston had improved over the last 10 years, 62 percent of all residents — and 74 percent of African-Americans — said they believe racism in the city is still a serious problem. The results generally reflect nationwide polls that have found that blacks are more likely than whites to say they have been treated less fairly by the police. Still, evidence suggests that relations between minorities and police may be better in Boston than in other cities. For example, a New York Times/CBS News poll released this week found four in five whites nationwide said their local police departments were excellent or good while a majority of blacks answered fair or poor. And a Gallup poll taken just before the fatal shootings earlier this month of Alton Sterling in Baton Rouge and of Philando Castile in Falcon Heights, Minn., found 48 percent of blacks nationwide believe police treat them unfairly. Boston police, who have faced protests in recent weeks, have said they seek to foster closer relationships with minorities by working with clergy and community leaders and by placing officers on walking beats in black and Latino neighborhoods. A spokesman said Boston Police Commissioner William B. Evans had not seen the survey, so it would not be appropriate for him to comment. Iván Espinoza-Madrigal, executive director of the Lawyers’ Committee for Civil Rights and Economic Justice, said the fact that one in three black residents in Boston say they are not treated fairly by the police underscores the need to diversify the department’s ranks. Curry said he was not surprised that blacks in Boston have an overall positive view of the police even as many express concerns about unequal treatment by officers.